FAQ: What's the best tank for storing a village's drinking water? Question: Hello. I am looking at drinking water storage tanks for village use. We are currently looking for an economical way to store bulk amounts of drinking water for villages in remote locations. Would you have a tank that could serve this purpose? The village holds approximately 50 people that would need to use the tank for their water supply. We were thinking 500 or maybe 1000 gallons. 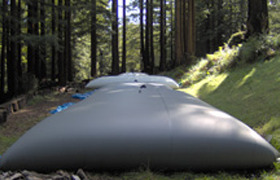 Answer: For bulk drinking water storage, one of the most flexible options available would be the collapsible water tank. This tank is well equipped to handle bulk storage (1 to 210,000 gallons) and has an extremely flexible exterior that allows tanks to be easily transported, shipped, and installed on your location. Another great option is a corrugated tank - more information below! The flexible drinking water tank is a great alternative to water storage and offers many advantages designed to economically provide you with the water storage you need. Tanks are designed in with a pillow tank exterior that will rise to form as it fills with water. When empty, the tank will lie flat and can even be folded for easy mobility to your designated storage area. Additionally fittings may be added to your tank to adapt to specific site requirements and recommendations. Since multiple people will be accessing your tank, ball valves can work to close and opening for water consumption. You might also consider adding items like water spigots for ease of use with your drinking water storage tanks for villages. View more about our Pillow Tanks. 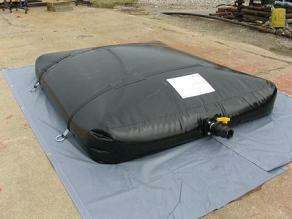 Listed on our site we offer several specifications for filled capacities of our collapsible tanks. 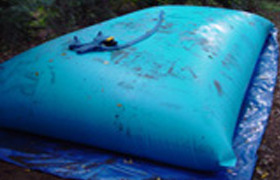 For the storage capacity that you have mentioned, our listed options include 500 or 1,100 gallons. If you do require a tank with a capacity other than the ones listed on the site, please don't hesitate to ask. Due to its flexible exterior, tanks can be made in almost any capacity up to 210,000 and occasionally 250,000 gallons. 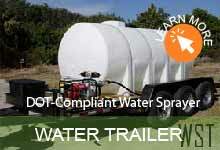 Learn more about the Collapsible Tanks for Drinking Water. Corrugated Steel Tanks are a great alternative to flexible water storage and is designed to provide you with economic water storage with longevity in mind. These bolted steel tanks install quickly and last for years. The field-erect design means that the materials and sections of steel are assembled on-site, making for economical and easy transport to your designated storage area. 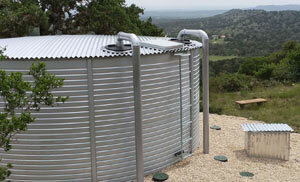 Or view our Water Storage Tank Types for more ideas!